“Financialisation” is an insightful concept when thinking about the modern economy, and how it has changed over the course of the last fifty years. It is something discussed in particular in Greta Krippner’s book “Capitalizing on Crisis” (Krippner 2011). Krippner outlines an example of this process in practice analysing changes in the US economy from the 1960s to the 2000s. Successive policy changes in response to developments in the real economy led to the highly developed financial economy of the 2000s. In practice this means the corporations come to rely on increasingly on the income from financial investments for their profits, and less on the return on investment in productive industry. Krippner quotes a 2006 study of the Ford Motor Company generating profit primarily by selling loans to purchase cars rather than from the sales of the cars themselves (Krippner 2011, p.3). This is a fundamental change in how the economy functions, reducing investment in production as companies instead chase profitable financial investments. The system becomes increasingly disconnected from the ‘real’ economy and prone to oscillation and crisis. It’s a process that Marx touches on in Volume 3 of Capital when he describes ‘fictitious capital’, speculation, and the credit system. As more money is invested, the banks use it to create more ‘fictitious’ capital to create more investments and so as the system begins to spiral out of control. It was a process like this which drove asset prices for ‘subprime’ US real estate to unsustainable levels leading to the global financial crisis of 2007-9. Michael Roberts takes up a similar theme in his analysis of the economy since 2007. His focus is on how companies need to search for different sources of profit as they try to survive a declining rate of profit overall, something which is a standard part of Marx’s analysis of a capitalist economy. There is little doubt that weak productive investment is driving poor ‘real world’ economic performance. Analysis by the UCL Institute for Innovation and Public Purposes suggests that “at the root of the UK’s weak economic performance is a low rate of investment“. Krippner’s view that individual policy decisions designed to tackle an isolated problem have resulted in long term and fundamental changes to the functioning of the economy also complements David Harvey’s view on how capitalism handles crises. For Harvey, building on Marx, capitalism is an inherently unstable system with a number of points where crises can form for different underlying reasons. When a crisis occurs, the response tends to address the immediate short term problem by moving the point of tension elsewhere in the system to re-emerge later. This is exactly the process that Krippner describes in the US. Policy responses developed in reaction to a present crisis put the economy on the path to the next pinch point and the next crisis, each widening and deepening the influence of finance on the economy as a whole. “Financialisation” then is a concept that helps the analysis of the modern debt-laden economy both as a response to the tendency of the rate of profit to fall (Roberts) and as a means to avoid an incipient crisis while unintentionally preparing the ground for the next (Harvey). This entry was posted in Economics, Uncategorized and tagged Capitalism, Economics on January 25, 2018 by 4harrisons. This is a technically complex work of sociology unpicking and analysing trends in US society, economy, and politics over the course of forty years from the 1960s to the 2000s. Krippner’s basic thesis is that successive policy decisions over the course of this period, each in response to immediate challenges, have ‘financialised’ the US economy. In other words, have shifted the focus of profit making from investment in productive activity to the ownership and exchange of financial instruments. Even major industrial companies come to make significant portions of their profit from activity in the financial market. This shift has significant implications for how the economy is managed, and the location of future crises. Krippner demonstrates this through a detailed analysis of economic data and a systematic review of policy shifts during this period. Although this is somewhat dry in places the case is convincing. She defines three separate phases. First the deregulation of the domestic financial market as an attempt to get to grips with the social crisis of the 1960s and 1970s, offering policymakers a ‘reprieve from difficult political choices’. Second the response to the fiscal crisis of the late 1970s and 1980s with growing government deficits which altered the relationship between the domestic and global markets driving a ‘dramatic expansion of credit in the US economy’. Finally on the realisation relying on market mechanisms offered in fact very little restraint on consumers, corporations, or governments how approaches to monetary policy developed incrementally in the period up to 2001 to control the demand for credit through interest rates (as opposed to regulation of the supply). Although the book was first published in 2011, Krippner stops short of the 2007-9 financial crisis, indicating in the introduction that she considers this to represent a separate stage of development that requires a separated analysis. That said it is clear that the ‘depoliticisation’ of economic decision making that Krippner outlines is a significant factor underpinning the later crisis. As Krippner explains, in making this change the expectation had been that the market would impose a discipline on economic behaviour that political actors were unwilling to do. In fact this has turned out not to be the case at all. The market has promoted and validated a lack of restraint particularly in relation to credit which has left us more exposed than ever to the risk of financial crisis. Although this is not Krippner’s intention, her analysis is a neat fit for the Marxist view of the long term tendency of the rate of profit to decline (see writers such as Robert Brenner and Michael Roberts). The declining profit possible in productive industry leads to speculation in what Marx called ‘fictitious capital’. This growing financialisation becoming increasing unstable and leading inexorably to crisis. The picture here is one that provides a deep-seated explanation for the financial crisis of 2007-9. So this is a fascinating book with many implications for further analysis. If a touch dry in places, it is detailed, well researched, and a thought provoking discussion of what underpins the modern economy. This entry was posted in Economics, Reviews, Uncategorized and tagged Economics, Politics, Review on January 21, 2018 by 4harrisons. Review: How Will Capitalism End? Wolfgang Streeck may not in fact answer the question that he poses in the title of this book, but it is still a superb read. “How Will Capitalism End” consists of a set of essays and speeches from the German sociologist published previously in New Left Review (and elsewhere) and organised around the theme of the challenges to capitalism. Each is a thoughtful and valuable contribution to the analysis of modern capitalist, it’s impact on society, politics, and environment, and what our options for the future might be. The opening essay sets the tone. It poses the suggestion that capitalism has so successfully eliminated all opposition to it’s conquest of politics and society that it’s destructive nature now has free rein without constraint from organised labour or political control. The end result will be the long slow death of capitalism’s ability to deliver for the majority of its inhabitants, without the prospect of its replacement by a different system which can pick up the baton as Marx originally envisaged. The remaining essays work around similar themes. The emphasis is on the impact of the neoliberal project to disconnect the management of the economy from political and social control. This can be seen in Streeck’s characterisation of the changing nature of the state leading towards the current “consolidation” state where having passed successively through private debt then public debt stages now exists to ensure that we reliably meet our obligations to asset holders. Another theme of Streeck is the divide between social rights and free markets. Where the democratic state prioritises providing public services for its citizens identified through elections. By contrast the “consolidation” state prioritises the contractual claims of creditors and the servicing of debt. The tension between these two has been a major driver for social and political change since the second world war. This is a thought provoking and very readable set of essays which should be of interest to anyone who doesn’t accept the orthodox economist world view. This entry was posted in Reviews, Uncategorized and tagged Economics, Politics, Review on January 10, 2018 by 4harrisons. After reading Rosa Luxemburg’s “The Accumulation of Capital”, included in Verso’s second volume of her complete works I wrote a post covering her analysis that accumulation could only proceed on the basis of there being sufficient space outside the global capitalist system for it to expand into. I recently re-read Marx’s and Engels’ Communist Manifesto (thanks to my wife, who gave me the best possible Christmas present for a radical). This was written in 1848, that is before Marx began his economic work. It is interesting therefore that Marx and Engels also point out in the Manifesto the importance of the non-capitalist economies to the growth of capitalism itself. Marx and Engels seem to have a similar mindset to Luxemburg in her analysis that capitalism needs to grow into the space outside itself in order to expand. Along with the points Luxemburg makes about capitalism drawing even those parts of the globe that are not part of the capitalist world into its orbit. As I wrote in my earlier post I don’t think that this is the end of the story, that their are other important factors both supporting and driving the expansion of capital. But it is interesting to see support for Luxemburg’s analysis in this earlier work of Marx and Engels. This entry was posted in Marxism, Uncategorized and tagged Economics, Marxism on January 9, 2018 by 4harrisons. One of Rosa Luxemburg‘s most important works is The Accumulation of Capital, written in 1913 and included in translation in the second volume of her complete works published by Verso. Here Luxemburg unpicks in detail the reproduction schemas described by Marx in Volume 2 of Capital. Marx defines two different basic formulae. Under simple reproduction, the economy remains the same size from year to year, with just sufficient productive activity taking place to replace what is consumed. Of course this exists only in theory. Capitalism is driven by the need to continuously expand, so simple reproduction serves only to demonstrate the basic approach to the problem. This method abstracts the economy into two basic sections. One part which produces just means of production, commodities supporting the production process. A second part which produces means of consumption, commodities which will be consumed by society. The two sections clearly need to work in close lock step. Sufficient means of production must be created to support continuing production. Sufficient means of consumption must be produced to support the population. Marx goes into mathematical detail (which I won’t duplicate here) to demonstrate how this interaction must work for the economy to function. In reality though, capitalism is driven by expanded reproduction, or ‘accumulation’. Here a portion of surplus value is used to increase the output of the economy year on year. Marx again shows how this might work mathematically, but somehow it is never quite convincing. This brings us to the key criticism made by Luxemburg. For the economy to expand in this way then there must be demand for the increased output of both means of production and consumption goods. Marx’s expanded reproduction schema shows production increasing. But where does the increased demand come from? An economy operating at a particular capacity simply ought not to generate the demand (backed by the ability to pay) over and above that needed for simple reproduction. Marx demonstrates mathematically how the growth of an economy should progress, but not the process by which this expansion can actually happen. What is more the expanded reproduction schema ignores the tension between the drive to produce more and more surplus value (and therefore commodities to be consumed for their value to be realised by the individual capitalist) and capitalism’s need to curtail the capacity for consumption of the majority of the population. The schema as described by Marx implies that accumulation can continue smoothly and indefinitely in mathematical progression. This does not match the lived experience of capitalism with it’s booms and busts. The absence of a smooth growth trajectory is a fundamental part of the system. In other words there must be a flaw in Marx’s analysis. Marx assumes throughout that the economy in question is a fully self contained capitalist one with only two classes – capitalists and workers – and this is where Luxemburg identifies the critical point. Capital has since the beginning existed in a world which includes significant elements operating in non-capitalist ways, whether it is left over peasants and handicraft workers in the same country or colonies and developing countries overseas. Throughout it’s history capitalism has not been the closed system that Marx assumes in the reproduction schema. Luxemburg gives two reasons why this is important. First the existence of a market outside capitalism itself creates the safety valve that is missing in the schema. This is where the demand comes from that allows the system to move beyond simple reproduction, allowing surplus value to be turned into capital and reinvested in expanding production. The progressive growth in production also implies a growth in the workforce and allowing the world outside capitalism to be included in the theory makes clear where these additional workers come from – that is the ranks of peasants and others who are progressively brought into the world of waged work. This is an aggressive and destructive process. Marx discusses “primitive accumulation” as something that kick starts the beginning of capitalism. Luxemburg asserts that in fact this continues all around us. In her time it was the growth of colonies and imperialism. In ours we might see it in the extension of commodity exchange to areas of life not previously touched by capitalism such as childcare. Luxemburg explicitly states then that when capital is no longer able to expand outwards into the non-capitalist world, when the whole globe is fully incorporated into capitalism, that the system will no longer be tenable and must collapse. Although there is much that is valuable in Luxemburg’s thinking, I think there are two basic problems. First that the century of capitalism since Luxemburg wrote this has shown it’s ability to find new spaces for exploitation. To the extent that her analysis is correct, it does not imply the approach of the ultimate crisis of capitalism that she is seeking to demonstrate. It simply confirms the system’s dynamic nature, its ability to find new outlets and opportunities for primitive accumulation. Nothing from the last hundred years suggests there is any inherent limit to this. Second and more significantly I think that Luxemburg misses Marx’s point. David Harvey points out that the expanded reproduction schema is constructed in such precise terms that it is hard to believe that Marx is not trying to point out that securing such a smooth path to accumulation is highly unlikely. Marx’s schema demonstrates the expanded reproduction is mathematically possible. But think about all the different processes that have to align in order for this to work: wages we must be suppressed to maintain profits, but sufficient to support realisation; the relation between producing means of production and means of consumption which must be just right to avoid overproduction as a result of disproportionality. Obviously the schemas are totally unrealistic, and Marx has cooked the figures to fit his case. But are the schemas so unrealistic as to reveal nothing about the nature of the stresses, strains and contradictions, as well as the dynamic capacities, of a capitalist mode of production? If not, what are the schemas intended for? In other words the schema is an analytical tool rather than a statement of categorical truth. Something which allows us to examine what mechanisms the system must possess for it to function, how they must mesh together, and more importantly where they might jar and clash. Luxemburg is therefore undoubtedly right to point out how difficult it is for expanding capital to realise itself in the market, and no doubt aggressively exploiting the remaining non-capitalist segments is part of how capitalism solves this. But so is debt, speculation, and the loss of value or destruction of individual capitals which guessed the market wrong. The system is fundamentally not stable. Marx’s toolbox can help us to understand where and how that instability appears and its impact. This entry was posted in Marxism, Uncategorized and tagged Economics, Marxism on December 18, 2017 by 4harrisons. Michael Heinrich’s “Introduction to the Three Volumes of Karl Marx’s Capital” is a fascinating short introduction to Marx’s ‘critique’. There are a number of key insights which I want to capture here. Chapter three goes into detail on the nature of value. Heinrich draws a distinction between what he calls a traditional Marxist ‘substantialist’ view and value as developed as a social relation through the act of exchange. In the ‘substantialist’ view value is understood as a property of each individual commodity, created during production. In Heinrich’s view this is not what Marx is getting at. Instead value is determined by “socially necessary” labour time, and what is socially necessary can only be determined in exchange where the individual labour of producers is compared to the total labour of society. Heinrich defines the substantialist view as a ‘pre-monetary’ theory of value, one which sees value as part of the commodity and money as a passive practical way to simplify the process of exchange. Marx’s theory is rather a ‘monetary’ one. Commodities cannot be related to each other without the value form that is money. 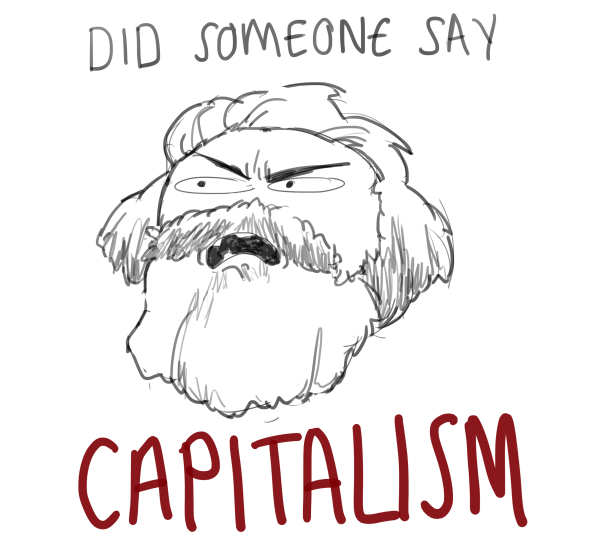 In chapter 7 Heinrich touches on the equalisation of the rate of profit, something which I felt I didn’t really understand on a first reading of Marx, defining the link between the amount of surplus value generated and the actual profit received by an individual capitalist. If commodities actually exchange at or near their true value then different rates of surplus value must mean that capitalists in different branches of production receive differing rates of profit. As explained by Heinrich rates of profit are equalised in process similar to “supply and demand”. Assuming that capital is able to move between different branches of production, then individual capitalists will gravitate away from areas with lower rates of profit and towards those with higher rates. As supply increases in the areas with higher profit rates, prices will fall and vice versa. The result establishes an average or general rate of profit. To the individual capitalist this process disguises surplus value as the actual source of profit, making it appear that profit is a premium added to the cost of producing it. Most importantly of all, this transition from value to price is a transition from one level of description to another. To see the dialectic whole from a different angle. Value mediates the relationship of individual labour to the labour of the whole of society. Price and profit mediate the relationship of individual capital to the total social capital. They are different poles of the same social relationship. Heinrich argues that Marx has not proven that the rate of profit is bound to fall over the long term (Heinrich 2012, p.151) on the basis that while it is likely that the organic composition of capital is increase, Marx assumes that the rate of surplus value will remain at least stable thereby leading to a falling rate of profit. In fact it is possible that the rate of surplus value may increase, or at least fall more slowly than the organic composition of capital rises either one of which will mean that the rate of profit does not fall. On crises Heinrich outlines an “underconsumptionist” view. The unrestricted nature of production struggles to realise value in a world where the income of most people is constrained. This leads to crisis as value cannot be realised in the market, leading to the destruction of social wealth but also conversely an increase in the rate of profit for the remaining capitals and a eventually a renewed upturn often driven by technological changes which improved profitability. In the final chapter, Heinrich offers some thoughts on how Marx envisaged a communist society working. This is of interest as a rule Marx did not write much about what would come after capitalism. For Heinrich there are two key differences. First that society is no longer based on exchange. Capital, commodities, and money no longer exist. Second humanity is emancipated from a social structure that develops a life of it’s own and impose itself upon each individual. The social relations which generate fetishism must disappear with society organised as an “association of free men”. Heinrich contrasts this with traditional Marxism-Leninism based on changing distribution patterns which remains dependent on a central authority, with the people becoming a passive object of the party’s policies. Heinrich, Michael An Introduction to the Three Volumes of Karl Marx’s Capital (Monthly Review Press, New York, 2012). This entry was posted in Marxism, Uncategorized and tagged Economics, Marx on October 23, 2017 by 4harrisons. This is a superb summary of the key points made by Marx across the three volumes of Capital. Heinrich is clear from the start that he seeks to avoid the simplifications of the one-time ‘orthodox’ Marxism-Leninism of the defunct Soviet Union. The analysis is sharp, succinct, and up to date. This is not a companion to the book itself, in the way that David Harvey’s two volume “Companion” is. What Harvey provides is a walkthrough, a genuine companion on the road as you work through each chapter. His goal is to encourage you to read Marx as a work of literature and on his own terms. By contrast Heinrich takes you away from the book itself to summarise and draw out the principle conclusions. He looks beyond the debates of the past within organised communism to assess Marx’s analysis from a modern dispassionate perspective. His section on the development of value within capitalism as a social relation I found especially insightful. Heinrich also does an excellent job of drawing together the three volumes to explain what Marx is attempting in each, while showing how they join to create a overarching analysis. The focus throughout is on the categories and structures of Marx’s economics rather than his philosophical approach. Heinrich specifically attacks the use of the word ‘dialectics’ in simple Marxism-Leninism as a way of saying ‘this is complex’. Bertell Ollman’s “Dance of the Dialectic” would make a useful companion work, covering as it does Marx’s method rather than the specifics of his economic analysis. In brief, a superb short outline of Marx’s economic analysis as laid out in the three volumes of Capital. This entry was posted in Marxism, Uncategorized and tagged Economics, Marx, Review on October 1, 2017 by 4harrisons.